I have been lucky enough in my graduate career to have traveled to Antarctica twice and logged ~60 total days at sea. All of my previous ocean-going research experience has been with the U.S. Antarctic Program (USAP) aboard the R/V L.M. Gould and RV/IB N. B. Palmer. Sailing as a new IODP science party member, I can’t help but compare my experiences on the JOIDES Resolution to those with the USAP. The main thing that stands out as different is the pace of the work. The working day on USAP vessels and the JR are the same: two shifts running 12 hours each, starting either at noon or midnight. This schedule maximizes the work that the science party can do with the available ship time. I began mentally preparing myself for 12-hour shifts before the cruise, but didn’t dwell on it too much. I had done this before. It would be fine… famous last words. My advisor, Amelia Shevenell, and labmate, Imogen Browne, both previously sailed on the JR and told me how busy it was going to be. I believed them, but I didn’t fully appreciate their words of wisdom until I stepped into the core lab for my very first shift. Admittedly, the first day at our first site started out slow because we had to wait for the sediment cores to equilibrate. The cores at the first site were coming up from ~650 m below sea level, plus an additional ten to hundreds of meters below the seafloor, so they are quite a bit colder than the 20°C core lab temperature. After the cores equilibrate to room temperature, the Physical Properties team runs them through a series of multi-sensor logging instruments to measure various physical parameters. These include magnetic susceptibility (a proxy for the relative amount of terrestrial material), thermal conductivity (to help determine chemical composition, porosity, structure, and fabric of the sediment), and natural gamma radiation (to aid in identifying clay composition). These measurements, which we make on whole round (un-split) cores, require about 45 minutes per 10 m core. 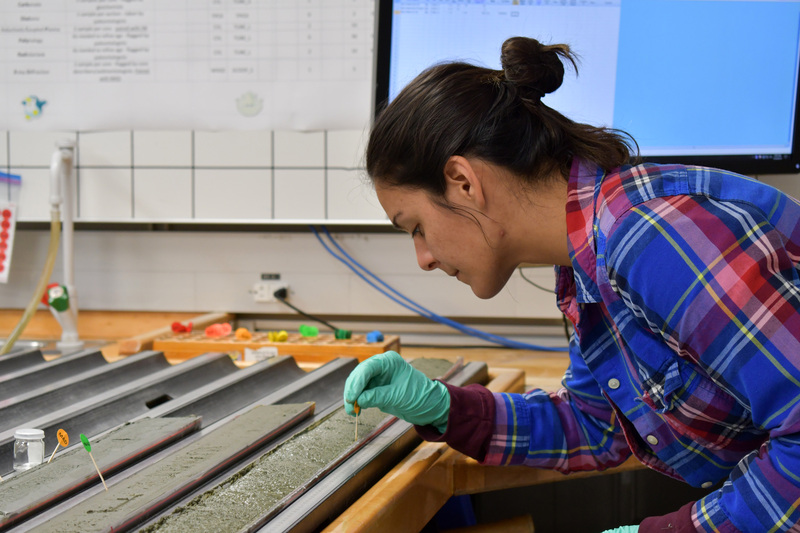 Although I am part of the Physical Properties lab, my main responsibility for the time being is to take individual samples to measure moisture and density (MAD), which happens after the cores are split. So I had a little down time that first shift, before things got crazy. Boy, did things get crazy! The next half of the shift was a steady (and frequently chaotic) interval of taking samples for moisture and density, weighing them, and placing them in the oven to dry for 24 hours. It seemed like the work never ended. Night shift finished their time in the lab, briefed the day shifters, and we went to bed, and then returned to an even busier shift 12 hours later. 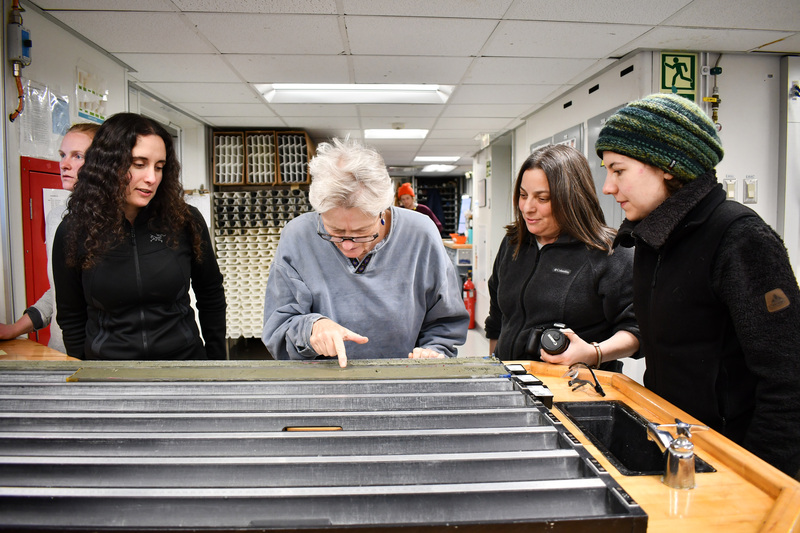 Cores kept coming up, other cores kept being split, working halves for sampling made their way to the sampling table, archive halves went to the sedimentology team for core description. Over, and over, and over again. I am not exaggerating when I say I spent maybe 30 minutes sitting down during that second 12-hour shift. Shifts are not always so fast-paced, but I wanted to share this story so that readers get a sense of the scale of an IODP operation. The JR is essentially a floating island of laboratories with a drill rig attached, outfitted with more instruments and equipment than I can normally access in any given day on land. These capabilities allow an international team of scientists from different subspecialities to collect and process tons of data, all at the same time. I find it absolutely amazing that we are out here at all, let alone imaging sediment with an X-ray machine, identifying reversals in Earth’s magnetic field, or continuously providing age constraints using microscopic fossils preserved in the sediment. I hope whoever is reading this also finds this amazing and checks back periodically to learn more about the expedition over the next two months. We’ve just left the Falkland/Malvinas sites and we’re heading south! Keep your eyes and ears open for more news about science, sediment, and sailing through the Southern Ocean. This entry was posted in Michelle Guitard by Amelia Shevenell. Bookmark the permalink. Fritz and Annette from Zurich and Ollioules!! I’ve been following you on Twitter as @larry79115 but am too illiterate to subscribe but I think I figured out how to do it now. BTW your diflagellate torturer from Utrecht : my daughter just started school in Amsterdam. Stay safe and may your work tasks be a joy.